The EU-Canada trade agreement enters provisionally into force on Thursday (21 September), sparking a rehash of old claims in the bloc about threats to food safety and environment. “The trade deal gives North American corporations tools to weaken European standards regarding growth hormones, chemical washes, GMOs, animal cloning, and Country of Origin labelling. What they have not achieved so far, via the WTO, they can now start undermining via CETA,” said Kees Kodde, trade campaigner at Greenpeace. The Commission has repeatedly said that there will not be a race to the bottom, either in social or in environmental protection. 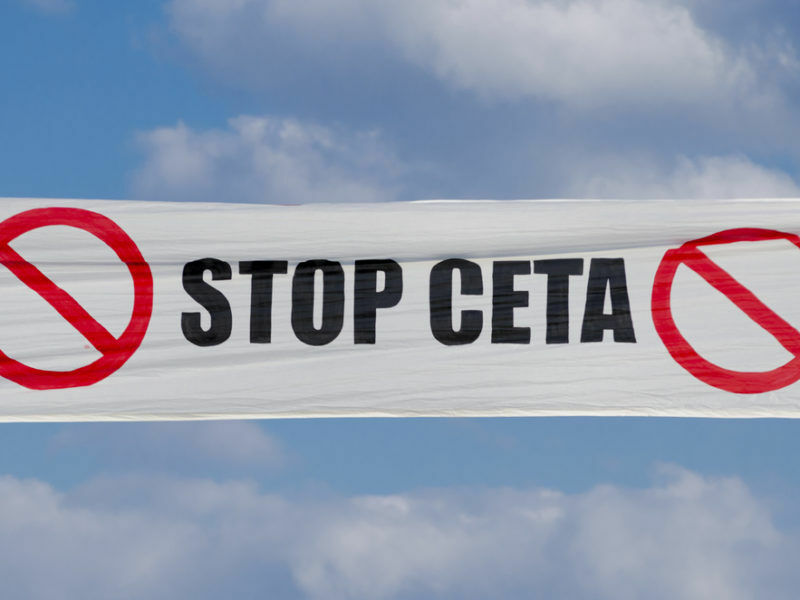 “CETA is off to a false start. Not only does the provisional application underline its undemocratic nature but the agreement itself remains unpopular in many countries, where parliaments are still to ratify it,” said Fabian Flues, trade campaigner at Friends of the Earth Europe, calling on parliamentarians across Europe to scrutinise the agreement seriously. 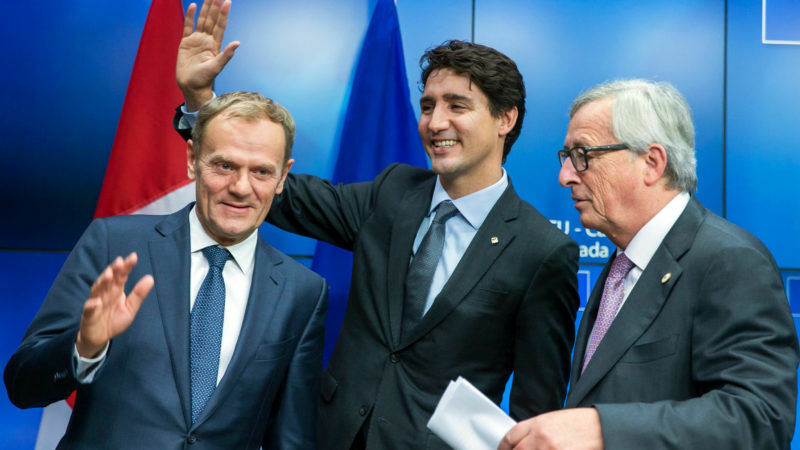 The EU and Canada signed the deal last October, following the EU countries’ approval. On Thursday, 90% of the agreement will enter into force. The accord scraps most customs duties, cuts prices and improves choices for consumers. After seven years of negotiations, and a bumpy final landing, the European Union and Canada signed a landmark trade deal on Sunday (30 October). But because CETA was declared a mixed agreement by the European Commission in July 2016, it will also need to be ratified by national and regional parliaments. European Commission president Jean-Claude Juncker rebutted criticism on Wednesday, saying that the EU-Canada deal has been subject to an in-depth parliamentary scrutiny which reflects the increased interest of citizens in trade policy. “The intense exchanges on CETA throughout this process are a testimony to the democratic nature of European decision making and I expect member states to conduct an inclusive and thorough discussion in the context of the ongoing national ratification processes of the agreement,” Juncker added. The deal explicitly protects EU governments’ “right to regulate” and the ability to set higher standards and level of protection for product and food safety, labour or the environment. “CETA is a modern and progressive agreement, underlining our commitment to free and fair trade based on values. It helps us shape globalisation and the rules that govern global commerce,” said Trade Commissioner Cecilia Malmström. Missing from CETA, for now, is the controversial investment protection clause, which gives companies the recourse to an investment court system if they believe their rights have been broken by a change in government policy. The court system has been the source of much strife among opponents to the agreement. On 6 September, Belgium referred the matter to the EU’s Court of Justice (ECJ), asking it to evaluate the validity of the arbitration procedure of the CETA under European law. This late submission, however, does not concern the whole of the free trade agreement, but only the investment aspect. There is no set timeline for when EU parliaments must vote on the agreement. The EU trade agreement with South Korea was ratified by national governments four-and-a-half years after most of the deal had already gone into effect. “The ETUC is in favour of fair and sustainable international trade” added Liina Carr. “The challenge is to improve CETA and all post-CETA trade and investment deals, to ensure they give workers’ rights the same importance as investors’ rights, and safeguard public services and environmental and consumer standards." 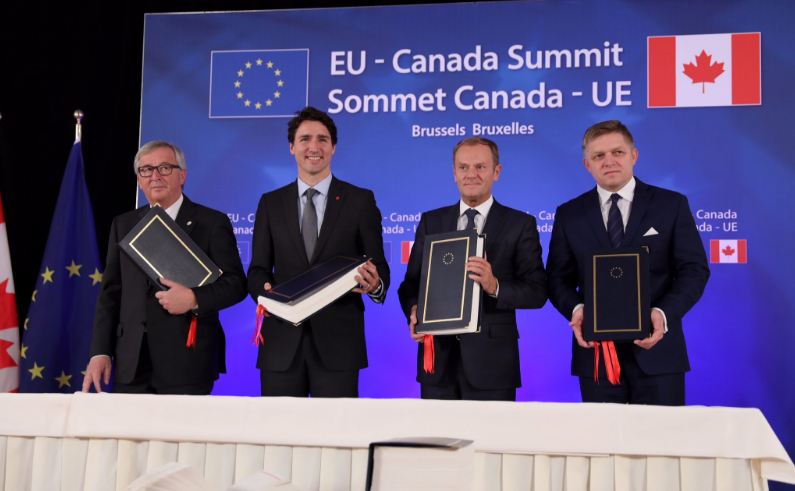 The deal marks a milestone in EU-Canada relations and the EU's trade policy. The Agreement is the most advanced economic and trade treaty negotiated by the EU and it enhances the best practices from both sides, the EU and our close ally Canada", said Artis Pabriks EPP MEP, who steered CETA through the Parliament. 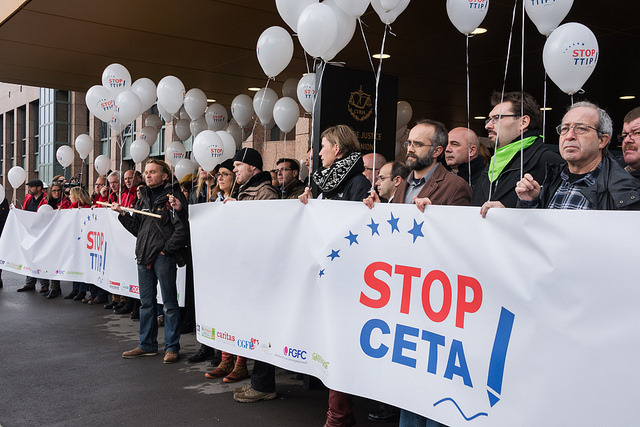 "CETA is a corporate dominated deal, the purpose of which is to reduce regulation on business. It is likely to lead to a race to the bottom in standards on food safety, environmental regulations and workers’ rights, and it will lock in the privatisation of public services," said Jean Blaylock, a trade campaigner with Global Justice Now. "A replicated version of CETA between the UK and Canada would be likely to include the most controversial element - powers for corporations to sue governments for enacting laws and making decisions that might be in the public good, but may impact corporate profit margins. There are numerous examples from similar trade deals where companies have used these powers to challenge labour laws, environmental protections and consumer standards.